The St. Tammany Parish Sheriff’s Office (STPSO) and Ochsner Health Network (OHN) are pleased to announce the launch of the Blue Connect Network for STPSO employees. OHN and STPSO developed a partnership that reduces healthcare costs for services sought at Ochsner Health System (OHS) facilities, including its partner hospitals, Slidell Memorial Hospital (SMH) and St. Tammany Parish Hospital (STPH). STPSO is reinvesting savings garnered through the partnership to offset the cost of healthcare for employee dependents and to support the organization’s operational budget. Leaders from STPSO, OHS, OHN, SMH and STPH worked with Blue Cross Blue Shield of Louisiana and HUB International to develop a program that would provide cost savings and high-quality healthcare to employers and employees. Partnerships between employers and healthcare providers are an emerging trend as organizations, large and small, work to provide competitive benefits to their employees. STPSO is the first sheriff’s office in the state to offer this type of benefit to its employees. 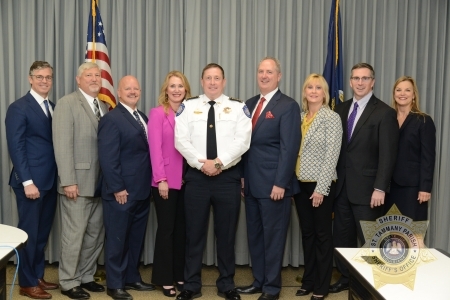 Sheriff Randy Smith was passionate about finding a creative solution to bring a cost management solution to his parish and worked closely with The Louisiana Sheriffs’ Association and HUB International to develop this plan. This partnership results in a cost savings of approximately $500,000 annually for the STPSO. “Finding solutions for healthcare consumers—including forming partnerships with other healthcare organizations and employers in our area—is a vital part of taking care of our community.,” said Bill Davis, former CEO of the Slidell Market, which includes Slidell Memorial Hospital, Ochsner Medical Center – North Shore, and affiliated clinics. Alongside each of these partners, Davis helped negotiate the contracts that led to this new network. Employees of STPSO and their families are offered a full range of quality healthcare services and programs from OHS facilities, including Ochsner Medical Center - North Shore, Ochsner Health Center - Covington, and partners SMH and STPH. SMH and STPH formed long-term strategic partnerships with OHS in 2016 and 2014, respectively. The partnerships focus on the continuation of high-quality care, cost reduction through coordinating and improving resources, and increased access to local care for North Shore residents.